When Henry Jackson died his will directed that the Stone House was to be sold. Before this sale a probate inventory was taken in which all of Jackson’s possessions were appraised, and the value of the Stone House was listed at $400. On 9 February 1834, roughly three months after Jackson passed away, a thirty-six year old silversmith and watchmaker by the name of Jacob Mytinger married the thirty-three-year-old widow Evaline Longacre Watson. As noted above, Evaline was one of Henry Jackson’s nieces, and an heir to one-sixth part of the proceeds of his estate. Additionally (as already mentioned), she inherited Henry Jackson’s female slaves named Vine and Jane, as well as the children belonging to these enslaved women. Methodist minister (and local merchant) John Allemong performed the nuptials. Evaline had previously married Isaac Watson in 1823 who died intestate in 1826. Evaline and Isaac had two boys named Joseph H. and James E. Watson before Isaac passed away. At the time of her marriage to Jacob Mytinger the boy Joseph was about ten and his brother James was about eight years old. At Henry Jackson’s estate sale on 28 February 1834 the Mytingers purchased the Stone House property for just $250. Not only was this $150 less that the appraised value of the Stone House, this was also the first time that the Stone House had been purchased with American dollars. As we have already discussed, all of the previous sales were conducted with the currency of the British Colonial monetary system of pounds, shillings and pence. During the period of Jackson’s ownership Americans had abandoned the use of the British pound in favor the American dollar. In 1834 an American dollar was still representing the value of an ounce of silver, or roughly ⅓ the value of a British pound. Thus the $400 appraisal value in 1834 was approximately equal to £133. This is obviously more than the £95 Henry Jackson paid for the property back in 1802. While there may be other currency conversion factors at play this appraisal price implies there were considerable improvements made to the Stone House during the period of Jackson’s ownership. On the other hand, the $250 Mytinger paid implies that either the appraisers got things very wrong, or Mytinger received a discount. Indeed it seems more likely that Mytinger got a family favor because of his recent marriage to Jackson’s niece. Unfortunately, the probate records are silent on this issue and we are left to speculate. It is important to note that when the Mytingers sold the Stone House six years later in 1840, the sale price was $500, $100 more than the appraisal value in 1834. This slight jump in value is difficult to assess. It is hard to imagine the Mytingers being responsible for any significant improvements to the property other than the necessary addition of a workshop that Jacob needed to carry on his work as a silversmith. This workshop would have included a charcoal or a coke fired forge with a bellows for annealing and melting down silver (or gold) in crucibles. It is worth noting, as we will address below, that the next owner of the Stone House property was a blacksmith who, after some modifications, might have found use for this sort of workshop. There also should be some archeological evidence for this workshop if it was detached from the main structure. Jacob had grown up in Newtown/Stephensburg. His father Daniel Mytinger (1760-1836) was a saddler in town who owned a home one block north of the Stone House on the opposite side of the street on lot 28. Jacob was the ninth of thirteen children born to Daniel and his wife Catherine Campfield (1768-1843), and the grandson of George Ludwig Meittinger (b1719 in Germany) and Margaretha Engelhardt (b1723) who had immigrated to America in September of 1754 and settled in Lancaster, Pennsylvania. Daniel Mytinger’s older brother, John Jacob Mytinger (1750-1793) served as an officer during the Revolution and as an aide to Washington escorting the retiring General on his return home to Mount Vernon after the war. Jacob’s parents Daniel and Catherine had married on 25 November 1782 and purchased Lot 28 from Lewis Stephens in 1786. As a saddle and harness maker Daniel Mytinger cashed in on the booming Newtown wagon trade in that era as did some of his offspring and their spouses. It is therefore worth noting that Jacob was the only one in his family to venture into the silver-smithing business. Jacob must have apprenticed elsewhere (most likely Winchester) to learn his trade as we know of no other Silversmiths working in Stephensburg during his formative years. He would have completed his apprenticeship at age twenty-one in 1818. It is worth noting that when Jacob’s older brother Isaac died in 1811, one of the witnesses of Isaac’s will was Richard Wells who was soon to purchase the Steele House/Store on lot 26 in 1814. Richard Wells was related to the Winchester clockmaker and silversmith Robert Wells who had moved west to Wood County (now West Virginia) in as early as 1804. As Robert Wells had moved west long before Mytinger was old enough to begin his apprenticeship it is a tenuous connection at best. Nevertheless, it may be a connection worthy of more research to determine if the son Richard Wells had any ties to other Winchester Silversmiths of that era who might have taken on the young Jacob Mytinger as an apprentice. Among the earliest surviving examples of Jacob’s work are a set of six silver spoons (engraved with the initial “SAM” and passed down in the family) that were given as a wedding gift in 1819 to his sister Sarah Mytinger who was marrying Alexander Marks. We do not know where Jacob was working at that time in his career but it is likely that it was at a rented shop somewhere in Stephensburg. Apparently he left Stephensburg for a while in the 1820s but he did come back. In July of 1829 Jacob advertised that he had “again” resumed his business in Stephensburg, where he would “thankfully receive the patronage of the generous public.” In the same advertisement he offered for sale an assortment of jewelry, rings, watches, pins, etc. 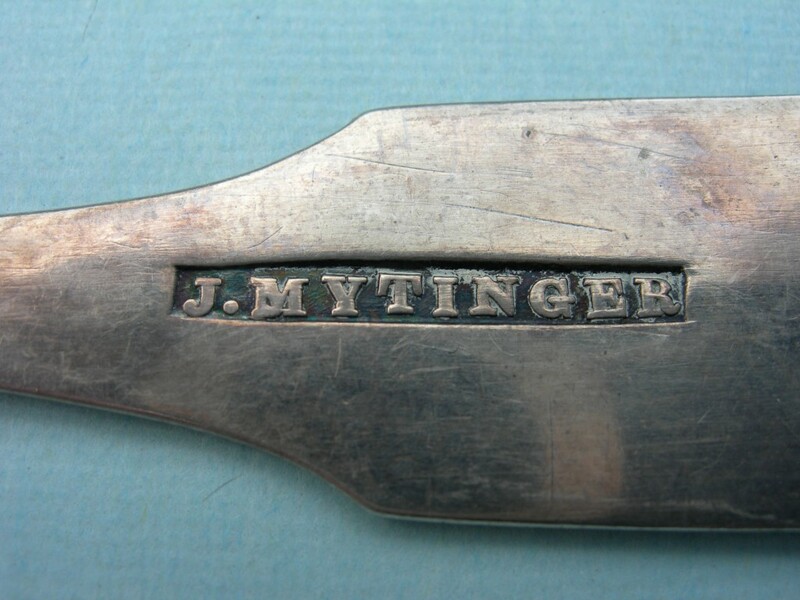 In 1906, Inez Virginia Steele in her book Early Days and Methodism in Stephens City, Virginia recalled that Mytinger “turned the silver coins into spoons and kept the timepieces in order.” Jacob had other financial interests connected to the town. During the years of 1823 and 1827 Jacob purchased a total of three five-acre out lots west of town. He would later sell them in 1848 for $450. In 1833 he was also listed among the subscribers from Stephensburg to Samuel Kercheval’s first edition of History of the Valley of Virginia. After purchasing the Stone House property Jacob, Evaline, the boys Joseph and James, and their slaves lived and worked there for approximately the next six years. By 1839 a daughter named Sarah E. Mytinger was born to Jacob and Evaline. We speculate that the Mytinger-Watson family lived in the log side, and on the second floor of the stone side. This would have left the first floor of the stone side for Jacob to use as his shop while the slaves lived in the detached kitchen in the rear of the house. (That detached kitchen is mentioned in a later deed from 1843, and will be discussed more hereafter.) In 1836 Jacob’s father Daniel passed away without a will and his household furnishings were finally sold off and recorded in court records on 3 February 1840. The public records of this estate sale show that Jacob and his mother Catherine Mytinger were present at that sale and that they purchased items that had belonged to Jacob’s father. Among these items, Jacob purchased one large cupboard, two candlesticks, a large Bible, a pair of salt cellars, four books, and a few other small items. A few months after the time Daniel Mytinger’s estate sale was being recorded, others records (including the 1840 census) indicate that Jacob, his wife and their children had already moved to Romney, in Hampshire County, now West Virginia. Jacob’s brother Daniel Mytinger Jr. had moved there earlier and it is likely that Jacob was trying to take economic advantage of the newly completed “Northwestern Turnpike” that ran through Romney between Winchester and Parkersburg (now West Virginia), on the Ohio River. (Currently this is the stretch of U.S. Route 50 between those two towns.) The deed recording the sale of the Stone House in July 1840 to a Blacksmith named Robert C. Miller indicates the Myingers made a healthy profit of $250. That yield was the same amount they had paid for it back in 1834. In short, the Myingers had doubled their money in six years.